Headquartered in Plymouth, Michigan, Mercy-USA for Aid and Development has always been an active partner in the greater Detroit community. We Care Backpacks Mercy-USA volunteers raised money, and assembled more than 400 backpacks filled with school supplies for children in kindergarten through 5th grade. We also distributed teacher care kits containing supplies like tissues, printer paper, dry erase markers and more. Teachers often spend from their own pockets to supply their classrooms with items needed to teach and maintain hygiene. Thanks for Giving food baskets for needy families at Thanksgiving time at a Detroit area soup kitchen. “Soup Kitchen Swap” Mercy-USA Muslim volunteers relieved Christian volunteers at a local Church soup kitchen in Detroit on Christmas Eve. 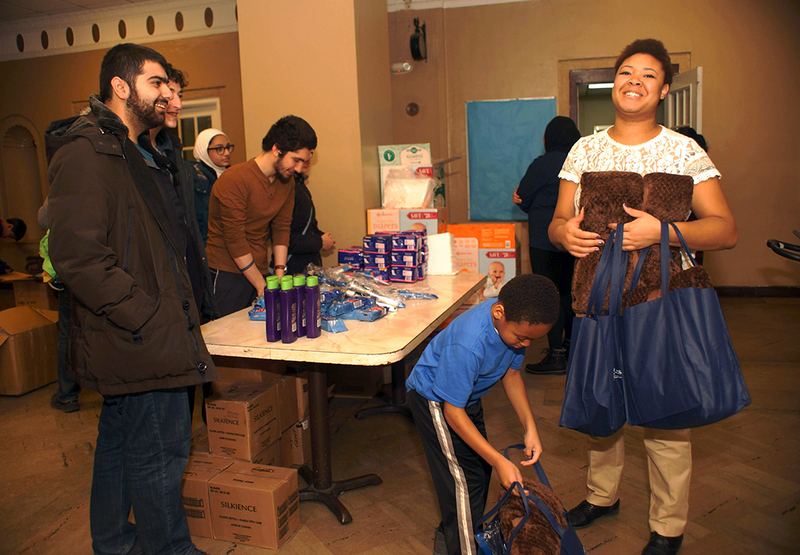 Urban Warmth Project For the second year, Mercy-USA for Aid and Development’s staff and volunteers distributed winter care packages to families and single adults in three of Detroit’s homeless shelters in February 2019. Staff members who manage these shelters told Mercy-USA that by the end of January their donated supplies dwindle while the need only increases during the very cold winter months. We organized numerous shifts of staff and volunteers eager to distribute the care packages that helped fill the needs gap for the city’s homeless population. Two of the three shelters covered serve families exclusively. The care packages included new winter items such as blankets, gloves, warm socks, plus basic hygiene items. Mercy-USA also donated disposable diapers and feminine hygiene items to the shelters. Basics of maintaining human dignity such as feminine hygiene, diapers and shampoo are necessities that can be unaffordable for families without a home. Mercy-USA wanted to make sure that besides keeping warm, the specific needs of women and their children were being met. When refugees come to the United States, their immediate needs are taken care of by one of nine resettlement agencies in a private/public partnership with the U.S. State Department. The resettlement agencies help the families locate affordable housing near services such as medical care, employment, and other vital services. The family is given a stipend and their rent is paid for a limited time, after that they are expected to manage on their own. This is where private organizations step in to help families locate all the resources they need to get on their feet and truly integrate into American society. 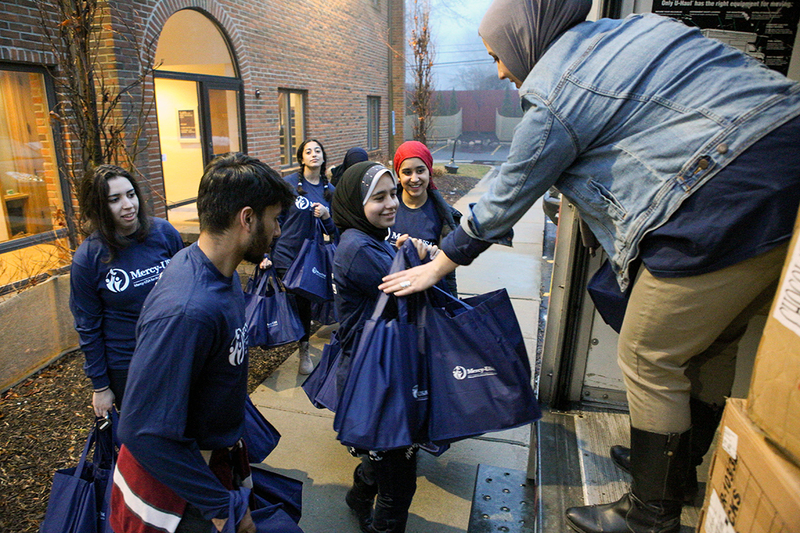 Mercy-USA funds two community organizations whose task is to assist refugees with everything from navigating the social services system, learning English, developing new job skills and finding gainful employment. Muslim Social Services Agency in Baltimore, Maryland offers refugee families a whole host of assistance in getting settled. Their caseworker is often everything to the family from guidance counselor, translator, employment coach, housing advocate and more. He is the lifeline to these families as he locates all the resources a family needs to make a successful life. The second Mercy-USA supported agency is Radiant Hands in Tampa, Florida. Their caseworkers help newly arriving families by partnering them with a volunteer from their community to ease the transition. They provide food, rental and transportation assistance when needed. They also provide translators, transportation for appointments, assistance with school registration, English as Second Language (ESL) class identification and school enrollment. In addition, Radiant Hands provides counseling intakes and referrals to professional therapy if deemed appropriate to deal with cases of PTSD. The needs are great for new refugee families, but both of these agencies are rising to meet the need and contributing to promising futures for families who have been through so much before arriving to our shores.